Well today is my fourth year of blogging. It's been a memorable four years--some good, some not so good. I've met some wonderful bloggers and authors and publishers and publicists, editors, agents, etc. The writing community is a tight-knit, much loved community that I am proud to say that I am a member of. I may not be published or a New York Times bestseller, but sometimes I feel like one. I want to thank all the authors who have allowed me to be with their babies and understand the difficulty it is as a reviewer. Because we all want to like every book we read. However that is not entirely possible and as a reviewer, we straddle that fine line of completely alienating the author who has allowed us into their world and read their creation. I thank all the authors and publicists and publishers for enabling my reading addiction with some terrific books. I look forward to another year of great books, good friends and interesting conversations. I just love this cover. I bet you all figured out what book it was! And like I promised I have a very special guest. Damien Locke has taken time out to answer some of my questions and boy does he have a lot to say! Laura's Review Bookshelf (LRB): How surprised were you when you realized that you had a Superhero for a dad? And have you reconciled the idea that he’s a good guy? Damien Locke (DL): Surprised doesn't even begin to cover it. How about mortified? Or maybe just nauseated. Things like this aren't supposed to happen to, you know, me. They're not even supposed to happen to other people--they're not supposed to happen at all. Am I okay with him being a good guy? It's not the fact that he's "good" that gets me, it's that he's too good. Like, saving kittens out of trees? Who does that? For a living? The more I think about it, the more I'm not surprised he did it in some dirty subway bathroom with my mad scientist mom. If you ask me, someone as unnaturally squeaky clean as the Crimson Flash had it coming. No one can be that on the up-and-up all the time. LRB: Do you think you’ll have the X on your thumb forever? DL: No way. I'm getting rid of this thing as soon as possible. Believe me when I say nobody wants to have an X. It's worse than having no letter at all, because at least with no letter there are tons of people out there who also have no letter. Even if I never get a V--not that I'm saying I won't, 'cause I will, but, you know, if I don't--an H would still be better than an X. Having an X is like a big sign to the rest of the world that you don't fit in anywhere. I might be one of a kind, but that doesn't mean I don't want to know where I belong. After all, it's hard to defy the rules if you don't even know which ones you're supposed to be following. LRB: Are you oblivious to girls? DL: Um, have you met me? Girls are the last thing I'm oblivious to. Some of my best friends are girls. And okay, maybe all of my friends are girls, but that just goes to show how not oblivious I am. Or how lacking I am in the friend department, but give me a break--my whole world just got turned upside down. A lot of my old friends aren't even talking to me, or at least they probably wouldn't be if I wasn't afraid to tell them I didn't get my V. Of course, the news is probably all over Golden City by now, and if it's not, it will be next year when everyone goes to Vilmore without me. LRB: If there was a kitten stuck in a tree would you save it? DL: Seriously, what is with all these people letting their kittens go outside and get stuck in trees? Maybe instead of more superheroes what this city needs is more responsible pet owners. And don't tell my dad, but, yeah, of course I'd save a kitten in a tree. But just so we're clear, I'd save it using only my villain skills. None of that flying crap that Gordon would do. A guy has to have limits, you know? LRB: Obviously you have more stories to delve into, do you think your audience will ever get to read more? DL: I have a team of highly trained monkeys working on it right now. At the rate they're typing, they're bound to come up with something cool any day now. I mean, you know, something true. They're not, like, making this stuff up. I want only the highest quality, non-exaggerated stories for my readers. Not that I would ever need to exaggerate about my exploits. That would be like adding ketchup to a fancy steak at a restaurant. Which is a really fun thing to do if the chef is watching. But, anyway, my point is you are so wrong if you think you've heard the last of me. Wow, Damien, I'm really surprised by some of your answers! Thank you for being a guest on my blog. You're my first guest character! I know that Chelsea loves you bunches! I know I said I'd post my review last night, but things happened so it will go up later today. 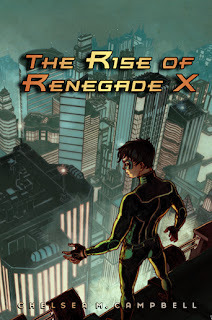 Also, just comment here and you're entered to win a special copy of The Rise of Renegade X by Chelsea M. Campbell. She will be mailing the book out to the winner. Thank you to Chelsea for allowing me to promote her book all week, it really is a fantastic read and I know that I am looking forward to more Damien Locke and his X. This is US/CA contest only.